Little Boy Beagle will be three in just over three months. He learns new things all the time and tries something new every day. A lot of the things he tries don’t always work, or even if they do work, they aren’t consistent. and would then try to help him with whatever he was doing, showing him how to do it, working with him to get it, and encouraging him to try again on his own. Many times, he would try more than once before giving up. He said “I can’t do it” a lot less, even when he couldn’t. He actually started telling others “You can do it” if he heard someone give up. All of these things are pretty cool, and if a two and a half year old can get it, I think we can all learn that lesson. If you fail at setting a budget, don’t just give up and say you can do it. Tell yourself that you can do it and start over again. And, as my son learned, don’t be afraid to ask for help. Work at it hard enough, and soon you’ll not only be doing it where you once thought you couldn’t, but you’ll be the one providing encouragement and advice moving forward. So, find something you think you can’t do. Tell yourself “I can’t do it”. We are dealing with this with my son right now. He is learning how to ride his bike (he’s 6) and he is having a hard time. Things usually come so easy to him and he’s struggling with the fact that he has to work on it. He wants to give up. We’ve been pushing him all week to keep trying to ride and he’s come a long way, but at first… it was very frustrating for everyone. Once he get it, he’ll be happy he stuck through it. Soon enough it’ll be second nature! That’s adorable. Sometimes, positive thinking really helps! It’s a lesson I know I could learn myself from time to time! It’s easy to find inspiration in our children. Despite the tantrums and a little too much sass at times, they are the very best thing in our lives. Inspiring post MB! Three is an awesome age. I’m right there with you, Beagle.. and often push my kids in the same fashion. I often push my kids to believe in themselves, telling them that those who do things my kids cannot do (play instruments, speak foreign languages, etc) don’t have any super powers. They are only human and worked on learning something new.. I am a huge advocate of positive thinking. Yes, it is a mental game. 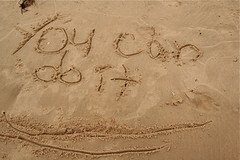 If you think you can do it, you can! Great article. I am a big believer in the power of subconscious mind. We can achieve anything in life if we learn to program our subconscious to affirm positively about our goals daily. Good point. Positive thinking lies deep and must be something we feel and believe, not just something we say.